"These Middle Eastern meatballs with garlic and cumin are heavy on the garlic, so feel free to scale it down if you wish. We love it as is! 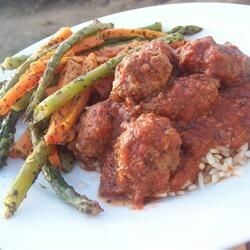 The meatballs and sauce are perfect served over bulghur. Bulghur wheat can be found next to the rice in Middle Eastern markets and even some of the bigger grocery stores. Prepare it as you would rice." Combine the ground beef, egg, garlic, bread crumbs, cumin, salt, and pepper in a large bowl until well mixed. Roll the mixture into egg-sized balls, and set aside. Heat the vegetable oil in a large skillet over medium-high heat. Add the meatballs; cook until firm, and browned on all sides, about 10 minutes. Remove meatballs from the skillet and pour out the fat. Bring the water to a boil in the same skillet over medium-high heat. Stir in the tomato paste, lemon juice, garlic powder, salt, and pepper. Bring to a boil, then reduce heat to medium. Add the cooked meatballs, and simmer in the tomato sauce for 5 to 10 minutes until completely cooked. This recipe is friggen delicious. It goes perfectly with this recipe for risotto also... Risotto with Sun-Dried Tomatoes and Mozzarella. Awesome. Good flavor. My meatballs fell apart, though. I've never had that problem before, but I just served it as ground beef over rice and it tasted good.